I really like the still pictures release today by tvn, let enlarge images. Cha Soo Hyun dressed as a dating girl with girlish hairstyle could make Kim Jin Hyuk be adored much more even Kim Jin Hyuk is always affectionate to his Cha Soo Hyun. the article says that the Cuba kiss caused sleepless nights for the audience members. It’s like the reporter was reading our posts. Jin Mi Ok, who is she? In the episode 6, two scenes with Jin Mi Ok caught my attention. Most of my analysis have been focusing on our OTP, however it is worth in a while to pay attention to secondary characters. But who is this Jin Mi Ok? She is famous in this forum as CSH's mother. Strangely, I couldn't remember her name hence I had to check on a web side. Then I realized that her name is never mentioned as such in the drama. Whenever Jin Mi Ok is mentioned, she is either called CSH's mother, the wife or the mother-in-law. As you can see, her function defines her identity. This illustrates the lack of her own identity. She has not made herself a name, she is just relying on others in order to exist. Striking is that she doesn't even introduced herself to JH, when she visits him at the Sokcho hotel. Our main character hears just from the manager "madam" that's how he realizes who she is. In this scene she uses her title as "the mother of the CEO" to take JH with her for a few minutes. She does the same with her daughter. She always uses her position as CSH's mother to visit her daughter at her office, any time she wants. She feels entitled to barge in CSH's life or to call her, when she is upset and wants to meet her daughter. She is CSH's mother after all. In this scene, JMO barges again in her daughter's office, like usually. Then she compares herself to her daughter. While CSH's dream is to create a good hotel, her dream is to enter the Blue house. She warns CSH not to ruin her dream. And if she does, then she will pay the price for it... even if she is her own daughter. Now, if you pay attention to the camera position, you'll notice that there are two mothers here. One is the real and the other is the reflection in the mirror. This is definitely not a coincidence because the director reinforces with this taking the pressure coming from JMO. 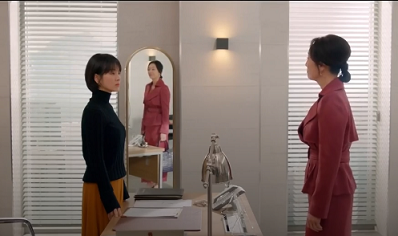 Then the viewer can see the desk between the CEO and her mother. CSH is hiding behind her desk, putting a distance between herself and her terrible mother to protect herself but this doesn't work as there is another JMO that is even closer to her. It was as if JMO's words were told twice which justifies the increasing pressure on our heroine. Moreover, we could also interpret that the smaller JMO, the reflection, is the one penetrating CSH's head, as she is standing next to CSH. The desk as border and protection seems useless here. Jin Mi Ok says to her daughter that relationship means nothing to her, only value is important. That's why she keeps saying that CSH needs to be a useful child. However, she contradicts herself with her statement because in her life, she uses relationships in order to get her dream come true. With no relationship, she can no longer use her titles like "the mother of the CEO", "the wife of the assemblyman CJH", the "mother-in-law" of JWS. Like I had written before, she has not made herself a name. In reality, JMO has no value at all, she is just a parasite who uses others in order to achieve her own goal. Interesting is that in the scene mentioned above, CSH tries to remind her of their mother-daughter relationship, asking her to act like a mother, since she keeps using the title "CSH's mother" but JMO doesn't understand CSH. She doesn't feel obliged to act like a mother because it is just a title she uses. The second scene in the episode 6 is with her husband. She is standing next to CJH who is sitting on the couch reading the newspaper. Their respective position reflects their situation in the couple: she is the one who has the saying, her husband seems to be rather passive. However, I doubt that CJH is a weak man. LEt us not forget that he was a famous anchorman who went on hunger strike for his fellows. He received attention from politicians hence he decided to enter politics in order to change the system. He never entered politics because his wife convinced him so. I have the impression that once his wife saw how popular he was (he became mayor of Seoul on his own), she started having this dream about the Blue House. Here, JMO acts as a brutal woman.. she even warns him that she might do worse if he doesn't show up at the ceremony opening for his daughter. Hearing this, I wondered first if she meant physical violence. Then I realized that CJH is a huge reader... see the books in the background. He used to be a journalist himself and he even offered a poetry book to his daughter for her birthday. All this seems to indicate that CJH is a huge reader (a common point with KJH)... so I believe that she meant, she would destroy his books. To conclude, in the second scene JMO appears as the person who has the upper hand in her marriage but she is just deluding herself in my opinion. She is forgetting that even if her husband is a thinker, he used to fight for more rights in the past. She is underestimating her husband because he is so calm and never stops her. But I believe that at some point, she will have a wake up call. Her husband is determined not to become chairman Kim's dog or horse race. He is a principled man with strong values. He refused to merge the two parties and he seems ready to fight against Chairman Kim. But now, let's go back to Jin Mi Ok. Noteworthy is the choice of her clothes. When she is about to go to the ceremony opening, she is dressed in blue. We know that chairman Kim will be there too. Then we shouldn't forget that CSH had been forced in the episode 1 to wear a blue tailor for the birthday party. As you can see, I see a link between the way she dresses and the events. She wears a suit that the chairman Kim would like. Then when she meets JH in the episode 9, she has a huge brown coat with some fur. Brown is the favourite colour of Chairman Kim. Here she is dressed like Chairman Kim. With her clothes, she wants to show KJH that she belongs to a different world. I am sure, she would never wear this coat in front of chairman Kim. In front of her, she is always dressed in a more humble way, as she is just a subject. She doesn't want to offend this powerful woman, the queen. As for the red suit, I would say that she doesn't need to follow a certain dress code. She is herself... confident. She can wear such a flashy suit, she knows that no one will stop her. She was right: JMJ could not stop her to enter CSH's office. And now, here is the question: will JMO lose her daughter for real? Since JMO claimed that she doesn't value relationships, CSH could say the same words towards her: "Because you don't value relationship, you are no longer allowed to use the title "CSH's mother"". Only her "mother-in-law" will become her new mother. This would be a satisfying ending for JMO. She loses her daughter for real. This note is a general warning to everyone who violated @Jillia's reminder, re-posted content that had been deleted for not taking heed of the warning put in place. I wonder﻿﻿﻿﻿ ﻿why your post got deleted, is thi﻿s﻿ ﻿thread being so strict that we cannot post ﻿anything we ﻿have in mind? ﻿Please be fair , it’s getting too silly and we are adults with open mind here﻿. No, as a user of soompi forums you have to follow soompi rules and obviously you can't post anything you want. I'm going to reiterate what @Jillia has already, and be more specific. First, this a thread related to boyfriend/ encounter drama. So it is expected that the discussion should be about the drama, anything else is off-topic. Second, off-topic content is for example the personal lives of actors/actress & outside/external negativity . Third, discussing the drama means only the episodes and the BTS. Fourth, soompi rules forbide bringing in external drama/negativity. What happens outside the thread doesn't concern soompi. We only take action if something happens within the forums. Last but not least, this is the final warning. If warnings are violated again, higher sanctions will be taken as @Jillia has already started giving out warnings, it can go from moderated content and locking the thread to temporary ban. Therewith, have a good day. Possibly in flashbacks? Now that’s a thought. As long as we get to see it, I’m fine with it. Guys, in episode 9 during their movie date, she pointed it out to JH that the movie house was practically empty. Do you think she’s giving him a hint that it’s safe for them act like bf-gf? It is very difficult to be SHKers, not only the the artist but also for the fans. And now, here is the question: will JMO lose her﻿﻿﻿﻿ daughter for real? Since JMO claimed that she doesn't value relationships, CSH could say the same words towards her: "Because you don't value relationship, you are no longer allowed to use the title "CSH's mother"". Only her "mother-in-law" will become her new mother. This would be a satisfying ending for JMO﻿. She loses her daughter for real. It will be satisfying ending for her, but I don't think CSH ever think about that, she is good daughter, she even appologize to her father for telling him about the politics he choose. And I'd love to see KJH's mom, CSH's mother in law treat her, csh will be very happy because finally she feel mother's love. Love your analysis @bebebisous33 keep it coming. Way to go Larry. Finish those task and free up your schedule for later or tomorrow, from your part of the world. Lol I had to remember who Jin Mi Ok is when i read the title. Excellent observation about the reflection! I did not notice that it was something significant at all. Notice the timing: CJH is involved in a campaign (this is a presidential campaign), when the scandal with JH occurs. During her conversation with director Choi, it becomes clear that Chairman Kim had already planned to involve CSH in a scandal to give an opportunity to force CSH to give up the hotel and to rearrange the marriage between her son and CSH. As you can see, her moves reveal that in reality, she needs CJH. Sure, later she claimed in front of JWS that she punished CSH for the scandal (forcing the artist to refuse to sell the painting), yet the scandal was created by her and her goal was to force CSH to give up. She just had CSH followed and used the ramen date as opportunity. Her anger in front of CSH is actually an act. She actually wants to put CSH under pressure. The marriage is mentioned, when there is an election around the corner. Her strategy is similar to the arranged marriage in the past... the loan MJO took from Taegyeong Group was the reason why chairman Kim could ask for CSH as daughter-in-law. Furthermore, her failed attempts to force CJH to merge the two parties prove to me that she is the one who is desperate... she needs more CJH than the other way around. When she claims that the assemblyman owes her so much, she is actually deceiving people. In my opinion, she is the one who profited the most but hides her true motives. The truth is that people like JMO or JMJ, even CSH believe her. Yet, Chairman Kim is well aware that she is dependent of politics. Besides, she is overestimating herself in my opinion. All the dirty tricks she played (the scandal, the possible loss of the Hotel in Havana) could be used against her. She damaged CSH's reputation and was even willing to put the company, Donghwa Hotel, in jeopardy. IF this is revealed, then she might be the one who ends up losing definitely Donghwa Hotel. I hope, the writer will use Nam as former journalist in this plot who discovers the truth and brings the evidence to light. I feel that chairman Kim who used the media to her advantage for so long needs to experience the terrible power of the media. She can not really control the media... her money can not buy everyone. Imagine her reaction, when she is involved in a scandal and her name is tarnished. Well, she brought it on herself. @rosiepeonie188 Great contribution!! MJO is linked to her place of residence. This proves that there is no longer a daughter-mother relationship after that conversation with her mother in the episode 6. Just a question, what is banpo-dong? Banpo-dong, isn't this where CSY's parents reside? @dukesa1122 @Tasia Yes, this is where CSH's parents live. But notice that this is the district she is mentioning. This proves that there is no longer a daughter-mother relationship after that conversation with her mother in the episode 6. How can a mother be too cold to her daughter like that? There were scenes though when it seemed like she was concerned for CSH. Such as the scene when she and CSH father was arguing and the loan issue was the topic. I forgot what episode that was. I never sensed that she felt concern for her daughter. It is just that she is afraid that CSH might lose the hotel. She got scared when CSH announced her that she would fight in a law suit against Taegyeong Group. I mean, she enjoys the title the mother of the CEO. IF CSH loses the hotel, the mother loses her title. She is just selfish. Besides, she is underestimating her daughter and her husband. I sent the YouTube link to a friend and all she kept saying was "woah woah woah..is this kdrama?are you sure?" Lol once upon a time we were used to dead fish kisses but TVN is a mood maker. that kiss they shared after KJH saying i love you wasnt really THAT sensual in the drama. If you slow mo and zoom it in though, that’s a different story. Dead fish kissing is one of the few things i hate in kdramas before. How can cable channels stream more of those though? Are they paying the movie policy law to be able to stream more steamy kiss scenes?